So, my old bike had a Shimano Deore 8-speed drivetrain, and I was getting about 10,000 miles loaded/touring before having to change chain/cassette/chainrings. I've done 2000 km on the new bike (CT4, Deore 10-speed), all of which were dry except 100 km, and I've worn out the chain/middle-ring/cassette. It skipped sometimes before, and then I fitted a new chain and I couldn't even cycle up inclines as the chain was slipping with even light load. Due to do the Transcontinental this year (reason for the new-fangled bike), but with a route of 4000 km I’ll not be able to even complete the race if this is all I can expect from Shimano 10-speed metal. Any suggestions? The drivetrain is kept in reasonable condition, and reasonably oiled (I’m not obsessive, but I hate creaking). Time to revert the new bike to 8-speed? Is it possible that there was a duff batch of metal? Are the lower-end Shimano components made of lower quality metal, as opposed to just being cruder machining? Yes, get a Rohloff like Thorn say! And if you want to stick with what you've got... I certainly got fewer miles from 8sp Acera then 9sp LX on my commuter versus the tourer, though the latter was more regularly maintained. So perhaps upgrading the groupset will improve things? That said, I think 2000k is a terrible result even for the entry level kit, let alone Deore. On my derailleur bikes I run the cheapest KMC chains, Sram 8 speed 11/32 cassettes. On one bike with about 5k miles on the chain, I am at 0.75 percent stretch point, plan to change chain soon. Cassette still good. I replace chains at 0.75 percent stretch, have not needed to replace any cassettes or chainrings yet. Regularly ride five bikes, so not a lot of wear on any single bike in a year. When my drivetrain gets noisy I lube it. Have never used 10 speed equipment, have no opinion. I am still running many of my bikes with 5-sp and 6-sp freewheels and friction shifting. They give phenomenal service life if I replace the chains regularly. One set of 'rings has 28,000 miles on the set (half-step and granny low, so usage evenly distributed). I reprofile the teeth on the freewheel cogs when they start to hook, then re-temper them. Pump the bodies full of Phil grease using an injector made for the purpose. Last forever. I found 7-sp Shimano Deore indexed shifting to be very long-lived. 8-sp seems to hold up acceptably well. Not so the 9-sp stuff. I can go through most of three entire drivetrains (cassette, chain, 'rings) in a summer's long use (cassette cogs are not available separately even if you remove the rivets, so a most-used cog can wear out, rendering the entire cassette useless). Shimano has supposedly improved service live on its 10-sp chains and cogs by using tighter tolerances and better hardening techniques. 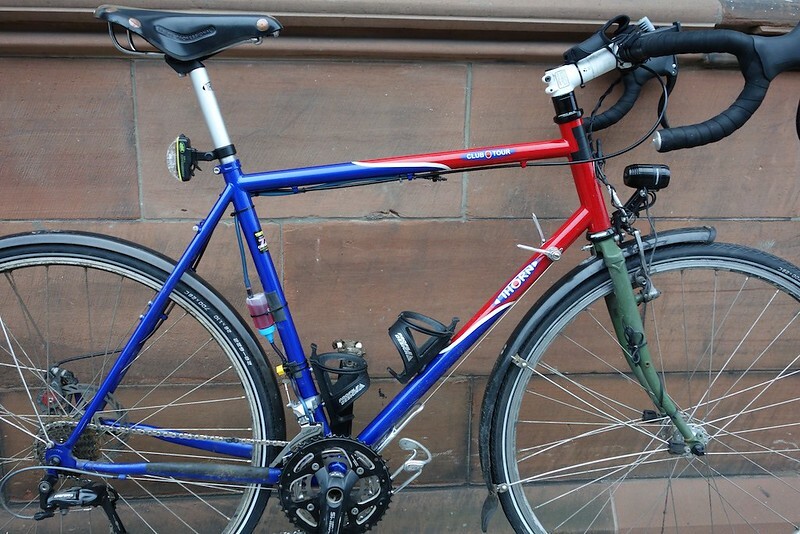 The real winner for the high-mileage cyclist these days is the Rohloff. More expensive to start with, it is cheaper in the long (really long) run, particularly as you don't have to interrupt a tour to install replacements. So, my old bike had a Shimano Deore 8-speed drivetrain, and I was getting about 10,000 miles loaded/touring before having to change chain/cassette/chainrings. No contest, go back to 8-speed. 10,000 miles seems extremely good for a derailleur chain. Even on hub gear transmissions, I've never done better than 8,300 kilometers, though hoping to improve in the future with Chainglider over a Rohloff transmission. I have a rohloff on another bike, which I don't use. I think they're an over-priced solution to a problem that doesn't (or didn't!) exist. As you (all) are confirming, and with my own experience, 8-speed and before all performed pretty well in the mileage stakes. Rohloff may be what someone prefers, but they're simply different rather than better. How many people, realistically, are going to do 100,000 miles or 200,000 miles? That distance is really only 5 or 6 conventional drivetrains, chains are consumed by both systems. Anyway, maybe that's changing with 9 and 10 speed, Shimano at least. If they're wearing out faster (about 5000km seems to be an average) then the cost does come into it. But this is my Thorn supplied bike, which I've just had to replace the drivetrain after 2000 km of very lightly loaded touring. So either Deore stuff is made of chocolate now, or maybe a bad batch? 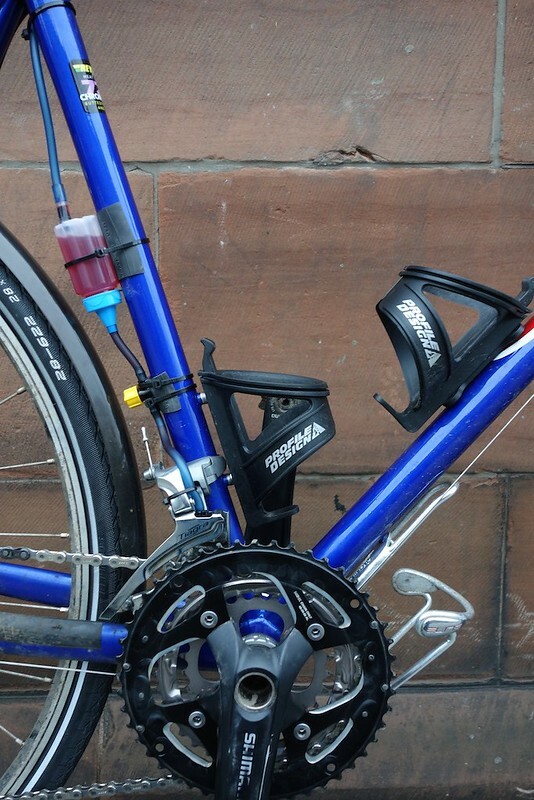 Recommendations from elsewhere are Stronglight chainrings and an XT cassette. The Hollowtech BB is a great improvement over the square-taper, which I could easily bend with normal pedalling. So I'll have a tough dilema if the stronger chainrings don't work out, 8-speed joy v square-taper misery. On our big trip across the Stan's we only had our older bikes equipped with derailleurs. We had 9spd's. I carried a spare chain (one for each bike) and changed them every 2000-3000km. I'd also give them a regular clean and oil. Most times I'd only clean them in soapy water let them dry and then oil them. Often just using leftover oil found in 5 litre containers that had been thrown away. A good technique was to cut a plastic drink container in half, and fill it up with the water. Then I'd fold the derailleur (while still on the bike) and place it in the filled bottle, then rotate the chain backwards. The chain would be more than clean enough. Try it. On the day when I swapped the chains, I'd wash them in petrol. Hey it worked for me. No trouble for the 15000km and the chains never skipped once. I dumped the chains (4 of them) at the end only to save weight on the flight home, but dare say could've done a fair bit more. Had you regularly measured chain stretch before the drivetrain first started slipping? Looking at events as you described them, it sounds like a case where a stretched chain led to rapid sprocket and chainring wearout, which is why the new replacement chain slipped under even light loads. Trying to figure which drivetrain component let go first. If it was the chain, then perhaps spares mailed ahead for pickup on arrival would prevent having to replace the cassette and chainrings as well? That said, 10-sp components are thinner than their predecessors, with less surface area. Profiling the teeth for indexing isn't a help to longevity, though it makes shifting a breeze. Yes, interesting Dan. I have a small valve under the top tube that I can open/close to let some oil onto the chain, and a second valve near the delivery point which I have 1/4 open to control the flow rate. All valves closed when I need to turn the bike upside down for extended periods. It's just a prototype at the moment, but works quite well. Did you end up with something yourself? I've used the Scotoiler on motorbikes, but just find it quite messy and seemed to always be adjusing the flow rate. The Shimano 7-speed brifter on my Trek 520 gave out. They don't make those anymore! I could have swapped out the whole drive train! For the want of a nail! I did successful move to downtube shifters on that bike. But that whole experience is what tipped me over into Rohloff land. The problem isn't so much derailleur parts wearing out, but that they stop making replacements and the necessary changes ripple almost without end. very true. my Simplex d/t levers are from the 80's, and there are not that many, secondhand, around. I tried the new Dura Ace d/t shifters, and they are nowhere near as good as my 80's pair. Could you use an 8 speed? I thought that 7 and 8 speed used the same amount of cable pull per shift? I still have a set of Simplex downtube plastic shifters and derailleurs with only a few miles on them. I took them off my new 1972 Raleigh Gran Prix when I worked at a bike shop, put on Suntour instead. My old Triumph bikes had chain oilers, ... ... but no pedals. I think going back to 8-speed is the answer. However, I need to find out if 8 speed chainrings fit hollowtech cranks/BB.